I’m here on a whim, the result of a seemingly random set of circumstances but how many of the decisions we make are purely a matter of chance? 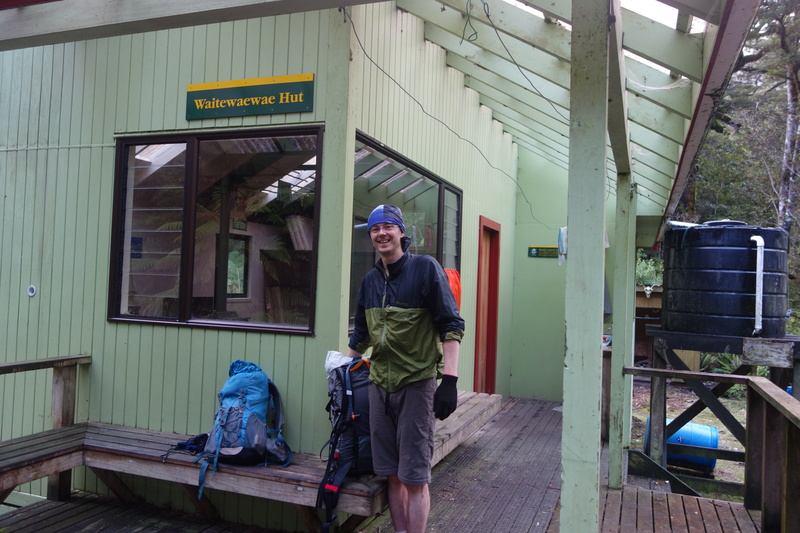 This summer holiday trip was supposed to involve tramping in the Makarora Valley further north or some adventures in another park further south. 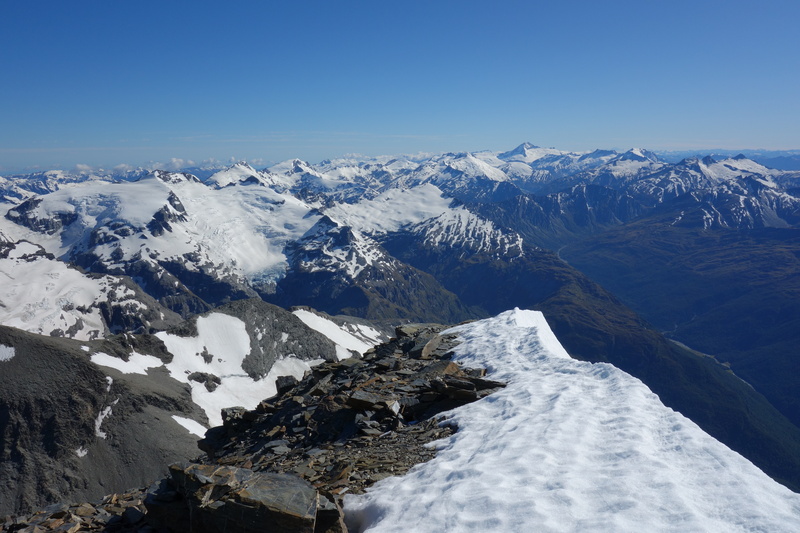 Illness and weather led me to Queenstown with a few spare days, a good forecast and a strong desire to climb another mountain. 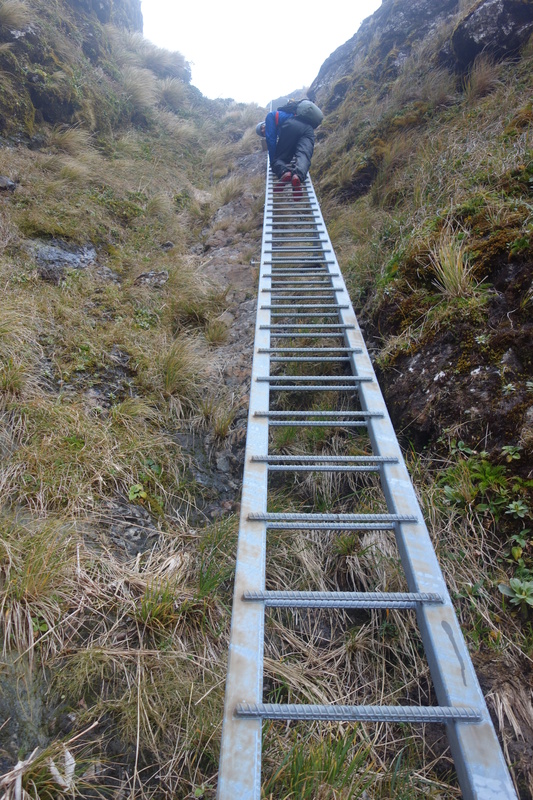 I had no ice tools with me but you can hire just about anything in New Zealand’s adventure tourism capital. The west peak of Earnslaw was the logical objective. It’s nearby, I know the route having been up twice before and I’ve yet to summit. But it isn’t summit ambitions that have drawn me to this beautiful spot. It’s almost a year since a friend of mine came up here. He didn’t come back. My head simmers with a mix of emotions, questions and memories. I first tried to climb Earnslaw soon after completing an alpine instruction course, one Easter holiday that saw us back off both Aspiring and Earnslaw. My first experience of good weather combined with bad snow conditions. My first experience of the difficulties inherent in climbing rock coated in verglas. 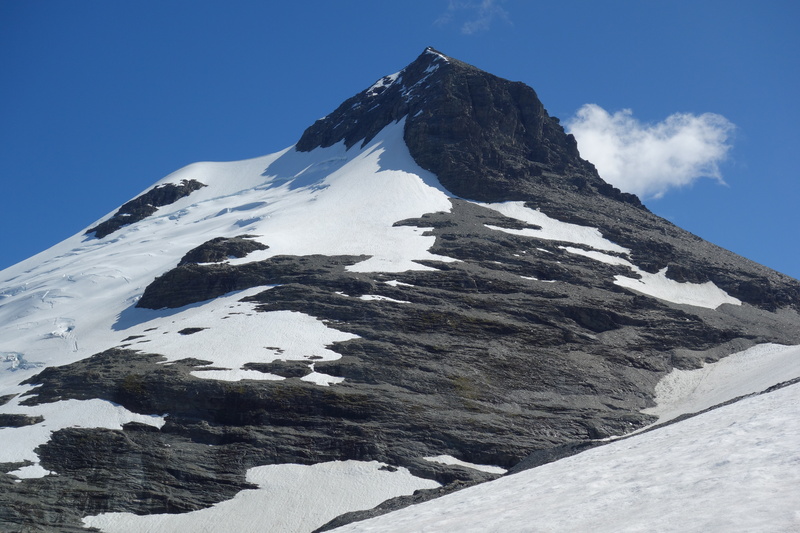 It was, we concluded ruefully, too late in the season for rock routes to be in condition and too early for the alpine routes. My second visit to Esquilant Bivvy coincided with New Year’s Eve, this time with friends looking for a cool spot to overnight at the end of a tramping trip further up the Rees Valley. The others climbed Mt Clarke while I stayed in camp convinced the wind blowing the clouds around up high would make the journey a wasted one. Sometimes you head into the mountains and, particularly if the weather keeps you hut bound for days on end you think your trip is never going to end. I thought that particular trip was never going to start. Torrential rain kept us in Glenorchy for long enough to sit through the first three days of an Ashes test. For most people an Ashes test would be the equivalent of watching paint dry, fortunately I enjoy watching cricket. We didn’t try to climb Earnslaw. Our party lacked the necessary skills and the weather was due to turn. So here I am at Esquilant Bivvy again. By coincidence or unconscious design, several other friends including a couple from the last Earnslaw trip, are here as well. It’s also New Year’s Eve. We catch up on what’s been going on in our lives. We discuss the route up Earnslaw, one group climbed it yesterday so they have current information. 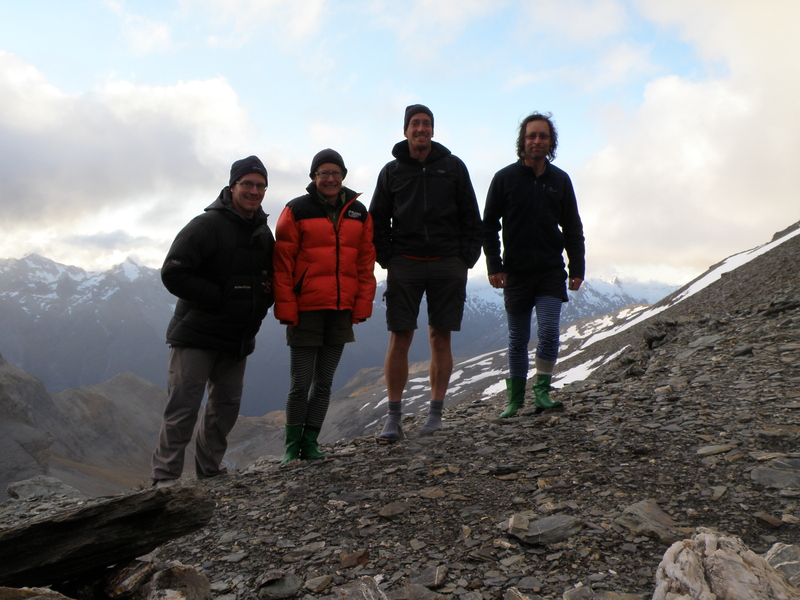 We laugh and complain about the rubbish rock and snow around Sir William Peak. We mention climbs and runs that we’re planning on doing in the future. We don’t talk about Simon. When we first learned Simon was missing I assumed he was just overdue and would turn up soon smiling sheepishly with tales of yet another peak bagged. I sent him a text asking him what he was up to. When it became clear that he wouldn’t be coming back I assumed his body would be recovered and we’d get to figure out what happened to him and where – all those details that help you process a loss by giving you something concrete to focus on – “facts” to counterweight feelings. None of this happened. As time passed I would sometimes struggle to accept that Simon was not coming back. I’d be in places like Fergs, or the Tararua Tramping Clubrooms or the Tararuas and half expect to see him half way up a climb, hoovering all the biscuits as well as eating all my chocolate stash or emerging from the rain and mist GPS in hand. Then I’d remember. Despite being a far better climber than me, Simon would sometimes invite me to join him on climbs but for various reasons, apart from another one of those “chance” meetings on the route to Mt Murchison near Arthur’s Pass before Simon took up climbing seriously, I never got around to it. 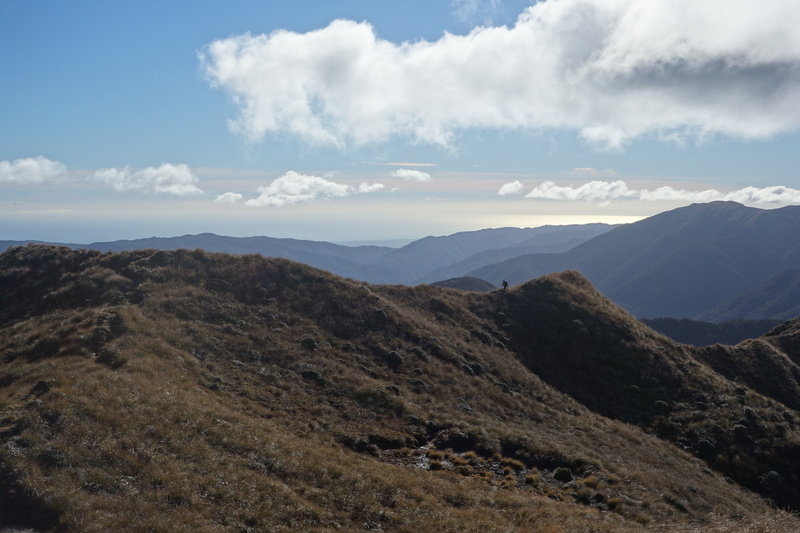 I did share a 16 hour mountain running adventure with Simon in the Tararuas. I decided I wanted to run the southern main range. This can be done in a loop from Otaki Forks. I wasn’t sure of the distance or how long it would take or whether I could do it but I’d tramped the route several times. I was planning on running it alone. I mentioned my plan to Simon. Rather than asking me if I had lost my mind he asked if he could come with me. I picked him up at 3am. We drove to Otaki Forks with Simon critiquing my driving as we went. 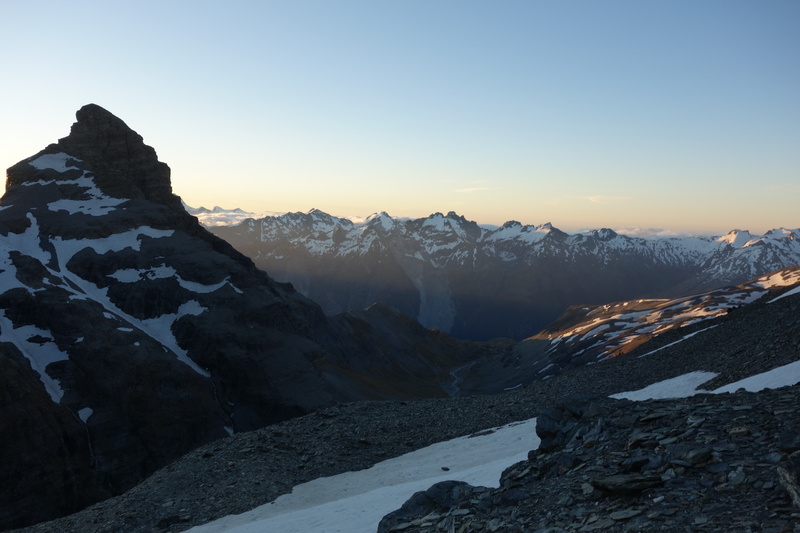 We started running towards Waitewaewae hut at 4am. 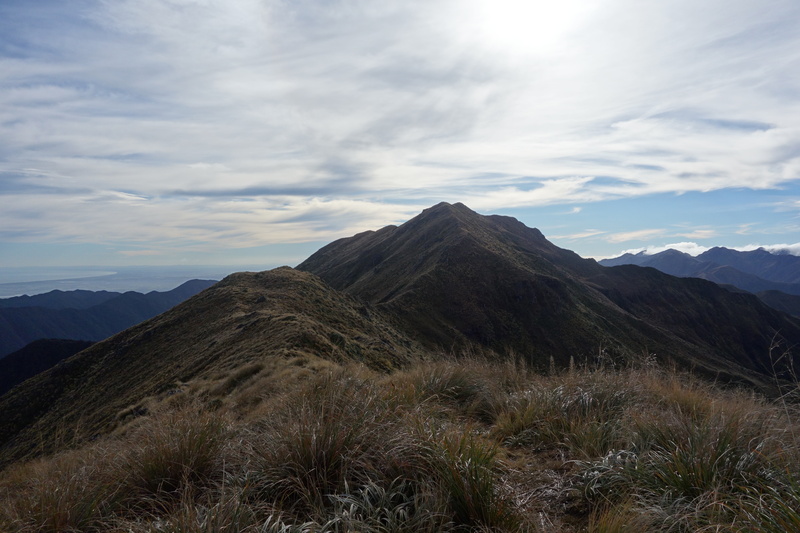 It was mid-July, dark and not particularly warm but the weather forecast was good and crucially the actual conditions we experienced were excellent by Tararua standards. Apart from a slight detour near the slip we found our way okay. After a break at the hut for Simon to cook his breakfast we headed up the hill to Andersons. I was in front, Simon was a very fit guy but he hadn’t done much mountain running. On the tops I made sure I could see him in the distance behind me but otherwise kept going. It was a lovely mid-winter day. 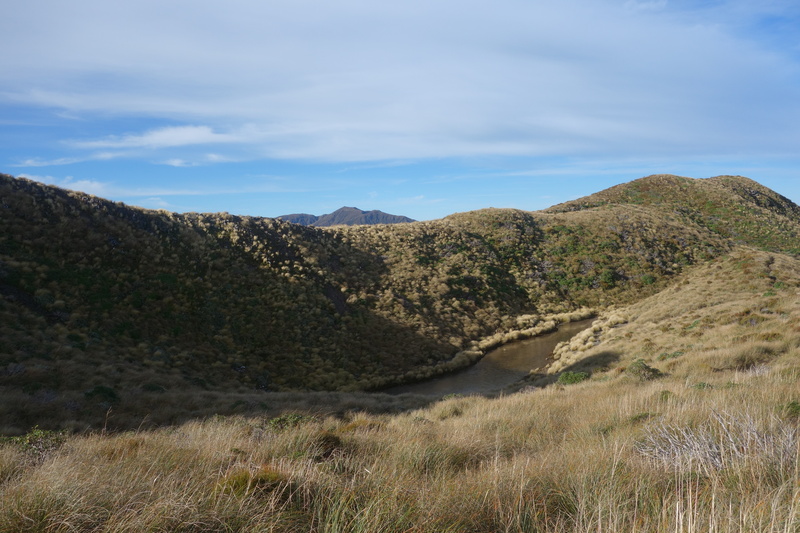 The tussock glistened and shone like gold. The sky was clear and blue. Nobody else was around. I felt invincible. 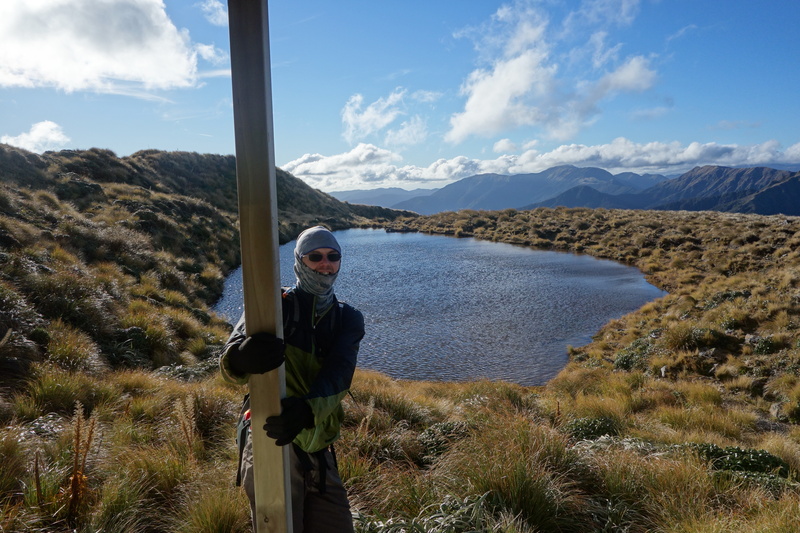 I found it hard to believe I had great visibility in the Tararuas in mid-Winter. At Andersons Simon pulled out his cooker and made me a hot drink and some instant noodles for his second breakfast. He also munched on a plum. He was carrying a piece of fresh fruit for every hut we passed. We joked about how we’d have to rename the southern main range the fruit salad range. I didn’t ask him how heavy his pack was but I was starting to think that maybe it wasn’t his lack of mountain running training that was keeping him behind me. We headed off towards Maungahuka keeping closer together now. I was tiring and Simon was keeping up, his stamina was starting to kick in especially now there was relatively less climbing. At Maungahuka Simon cooked up another hot meal and made me a hot drink. In the east low cloud was starting to roll in, it looked like conditions were going to revert to normal for this mountain range. Simon checked his map along with his GPS and talked about exit routes that we could use if the wind picked up on the tops. Penn Creek Hut was an option. I’d never been to Penn Creek. Suddenly I was glad I wasn’t doing this alone. 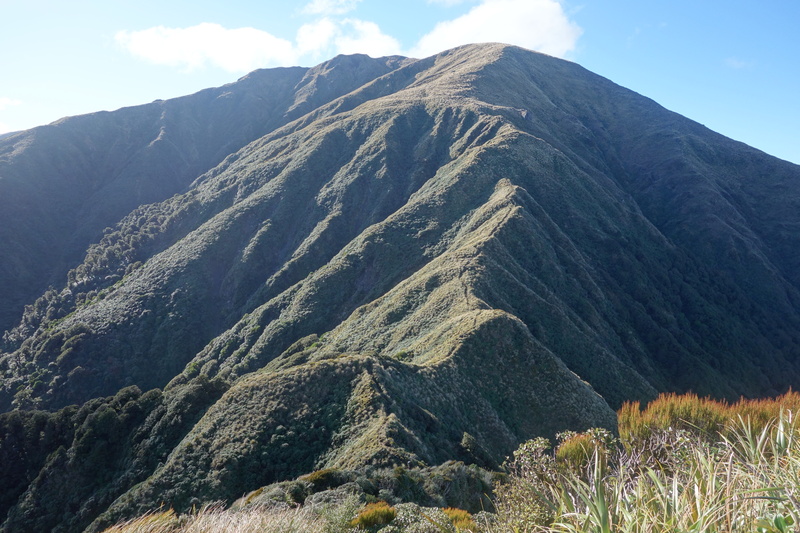 Up the ladder, over Tunui and Tuiti, the famous Tararua Peaks and onto the hills that lead to Bridge Peak and the Kime Hut turn off. It’s dark by now, cold and claggy. We have on all our clothes and we’ve slowed to a walk, focused on sticking to the route. The hills seem endless. 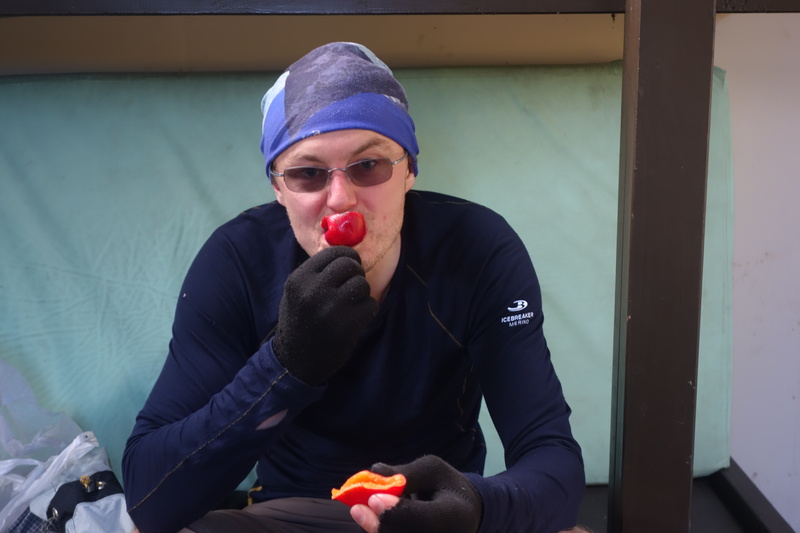 Simon counts them off – McIntosh, Yeates, Vosseler, Boyd-Wilson Knob and finally Bridge Peak! We chat and share a few laughs. Simon has me go first while he checks the route. His laid back approach belies his meticulous attention to detail. He knows the Tararuas are unforgiving. We’re knackered. 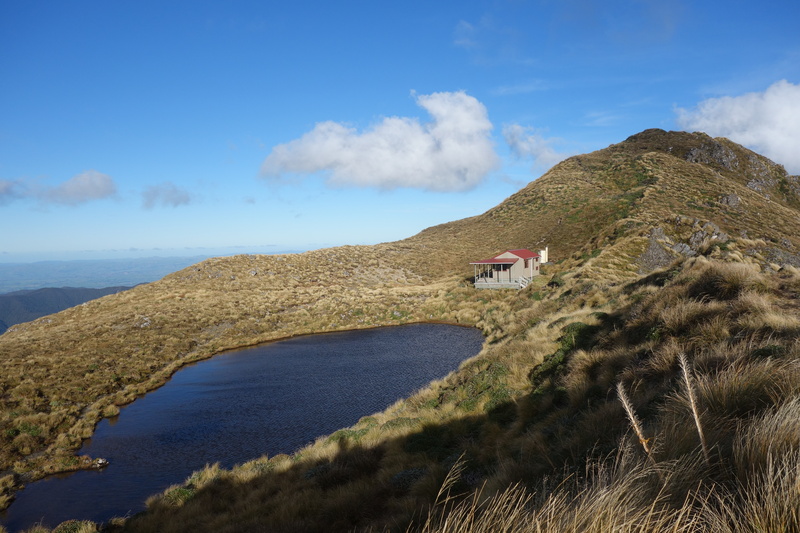 On reaching the southern crossing trail we climb over Dennan and Table Top and descend the stony track towards Field hut. At Field we decide we don’t need another hot drink. We consider dossing down for the night and finishing the route off in the morning but we are both keen to finish what we started in one go and the hut is full of scouts. A full moon provides light on the final few kilometres down the hill and we allow ourselves to relax. Simon is amazed we’ve “run” the route in a day, what an adventure! He reckons he might need to do a bit more running before he tries that again. Later he emails through a few terrible photos of me plus a spread sheet detailing the precise distance covered. Back at the car I’m so tired I can barely keep my eyes open but there is the drive back to Wellington to be completed. This resembles the drive out with Simon still giving me driving tips. I don’t mind. New Year’s Day we’re up early but it’s not an alpine start, we want the rock to be dry. Four of us climb the west peak of Earnslaw. 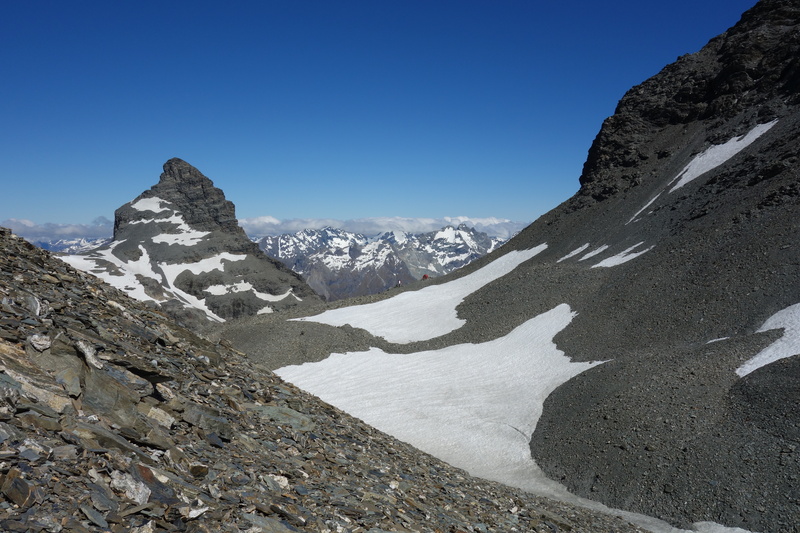 The climb is straight forward, a matter of picking our way up scree and across rock ledges following cairns and accessing the right gully at the right place to avoid bluffs. The view from the top is more memorable than the climb. 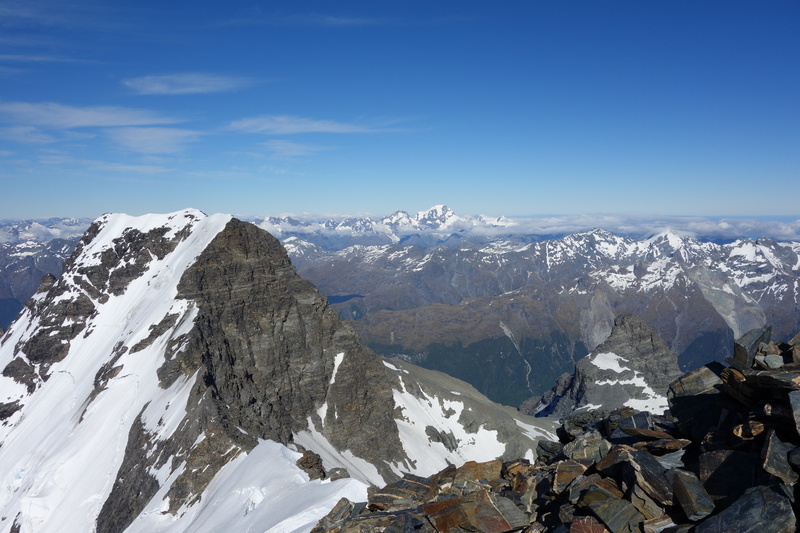 Lake Whakatipu and the Rees Valley spread out directly below, the Darren Mountains, the rest of the Forbes Range, Mt Aspiring, even Aoraki/Mt Cook in the distance. The east peak of Earnslaw looks tricky. Esquilant Bivvy is visible far below a tiny red dot on Wrights Col.
Time spent in the mountains is time well spent. Climbing has taught me to be more comfortable with what I don’t know, to embrace uncertainty. I’ve come to appreciate that managing risk is not something you can master by reading a text-book. Good judgement comes from experience, listening to your heart as well as your head and listening to other mountain people. It’s about being prepared and preparing for a few mistakes. There are many shades of grey, no right answers and no guarantees. Summits don’t matter, being aware of your surroundings, thinking about your safety and living in the moment does. Looking after and establishing trust with the people you go into the mountains with is as important as thorough planning. Simon was a friend I made in the mountains. Visiting the mountains makes me feel alive. Simon didn’t come back but when I’m in the mountains he is with me.